How is import cargo released from Angola Customs to importer? Who are the parties involved in import customs clearance formalities in Angola? Import cargo clearance in Angola Customs. 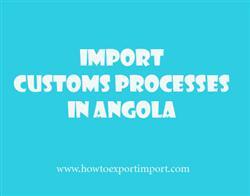 What is the customs process in Angola to import? The information provided here details on how to import goods to Angola especially import customs clearance procedures in Angola. The Angola Customs, who is assigned with execution of the entire edict issued by the country’s ministries and governmental institutions which concerned, controls illegal trade and is facilitator of genuine trade.